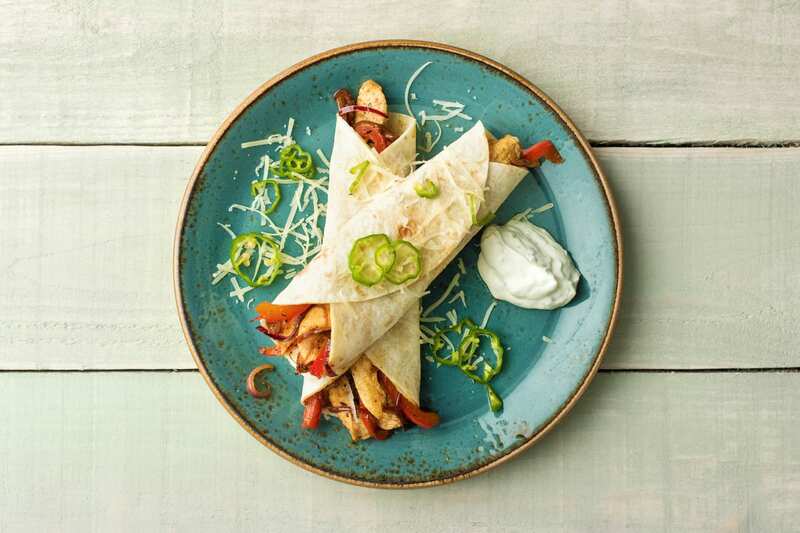 Fajitas are the ultimate crowd-pleaser, especially with ingredients as delicious as these. We’re upping the ante with our Mexican spice and an unbeatable zesty lime and sour cream topping. Finishedwith tangy quick-pickled green chillies, this will be a fajita night to remember. Remove the core from the red pepper then thinly slice. Cut the red onion in half through the root. Peel and thinly slice into half moon shapes. Thinly slice the green chilli. Zest and juice the lime and grate the cheddar cheese. Thinly slice each chicken breast into strips. Tip: Thoroughly wash hands and surfaces after handling the green chilli. The heat is transferable and can burn more than just your throat! Now to quick-pickle your chilli. 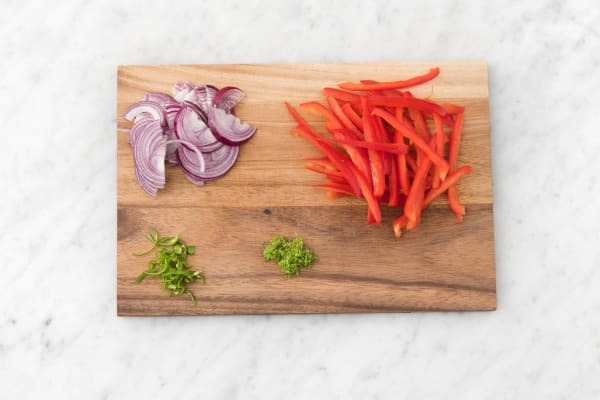 Place your chilli slices in a small bowl and toss with half the lime juice. Leave to the side for later. Now to cook your veggies. Heat a drizzle of oil in a large frying pan on medium high heat. Add your pepper and onion and cook, tossing, for 7-8 mins, until soft and slightly caramelised. Season with a pinch of salt and a generous grind of black pepper. Transfer your veggies to a bowl and wipe out the pan with kitchen paper. 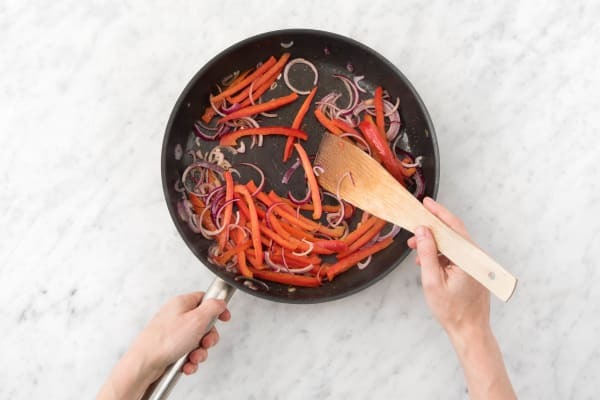 Put the frying pan back on medium-high heat and add a splash of oil. Add your chicken and cook for 5 mins, stirring occasionally to allow your chicken to brown. After 5 mins, add the Mexican spice and cook for another 5 mins or until your chicken is cooked through. Tip: The chicken is cooked when it is no longer pink in the middle. 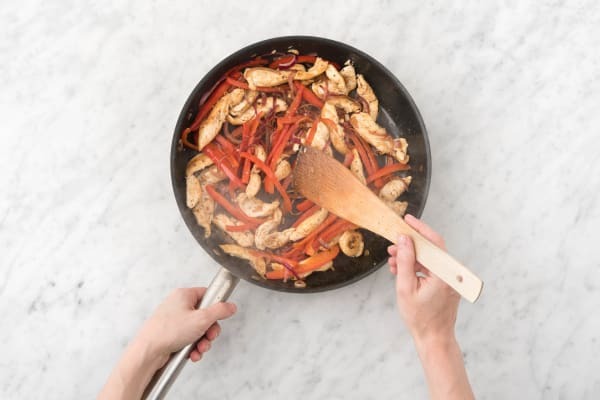 When your chicken is cooked, add your veggies back into the pan and cook for 1 minute or until warmed through. Next make the zesty sour cream. In a small bowl, stir together the sour cream, lime zest, and a dash of lime juice. Season with salt and pepper. Place your chicken mixture inside each tortilla and top with your cheese. Finish with a dollop of your zesty sour cream and pickled chillies, roll it up and enjoy!